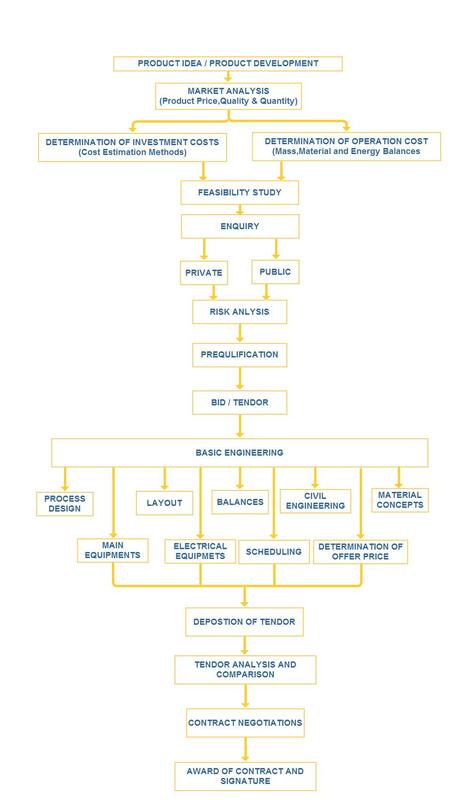 A typical process plant or oil and gas project comprise of many stages from concept to commissioning and production plant. A typical process project can be broadly divided into two major phases. Project planning is the very basic engineering activity carried out to plan, forecast and analysis of cost, feasibility, material requirements, procurement and award of contract. This phase is also called basic engineering phase. Project execution involves designing ,detailing and construction of the plant till final commissioning , start up and handover to the client. This phase is also called the detail engineering phase. A project is a temporary effort to create a unique product or service. Projects usually include constraints and risks regarding cost, schedule or performance outcome. Project management is a set of principles, practices, and techniques applied to lead project teams and control project schedule, cost, and performance risks to result in customers. Oil & Gas industry or process industry opt for EPC contracts for most of their projects. EPC means the company is contracted to provide engineering, procurement and construction services. The project is largely contractor managed and the cost risk control are weighted towards the contractor and away from the owner. EPC projects are no longer restricted by the boundaries of the countries and are separated by long distances and cultural divides. These projects require proper coordination between the project partners. From a technical standpoint it is important to make use of available global design tools and technologies and network with the project partners such that all the team members have access to working databases. Some owners have preferred breaking a large project into more manageable and defined pieces. For example, a project that includes structure and topsides fabrication, installation, and pipelines may have three major contracts awarded, one for onshore fabrication, one for installation, and one for pipelines, each to contractors who specialize in these areas. The owner then manages the interfaces. The contractor is expected to execute the job on vertical split basis with single point responsibility . Other owners have developed "open book" relationships with contractors and risk-reward schemes where a project is executed against a given budget and overruns or under runs are shared. In all cases, the best results are achieved by developing a team mentality so that all stakeholders - the owners, contractors, and engineering firms- are all working together towards the same goal with all sharing in the success of a project. EPC tends more to lump sum turn key projects as where the engineering contractor is also fully responsible for the construction of the project until mechanical completion.This means that the engineering company has direct contracts with the construction contractors. Oil & Gas, Power, Chemicals & Petrochemicals and Infrastructure sectors opt for EPC LSTK contracts for most of their projects. As the EPC contractor becomes a single point of responsibility, this offers better-cost realization and also promises the project delivery within the scheduled time frame. Moreover from the project owner's perspective, turnkey contracting is a better proposition as the responsibility and majority of risks involved with the project lie on the contractor. In an EPCM contract, the consultant is typically contacted to provide project management, engineering, procurement and construction management services. They will usually manage and administer, on the Owner's behalf, the Owner's contracts with construction contractors. Sometimes EPC is extended to EPCC (Engineering Procurement Construction and Commissioning), or even + OM (Operating & Maintenance). These construction contract methods can be tailored to the individual projects / owner’s needs. Some companies can go as far as breaking up each portion of the EPC / EPCM (Engineering, Procurement, Construction / Construction Management) to separate companies. One company can do the engineering; another can do the procurement, while still another can do the construction / project management). Each company must decide for themselves, with the advice of legal and financial counsels, as to which method of construction contracting is best for their particular project and situation.